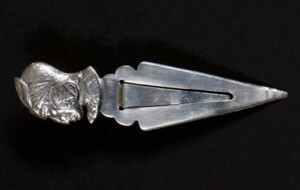 Every day, the humble bookmark becomes more and more of an anachronism, an object associated with the way we were rather than the way we live today. 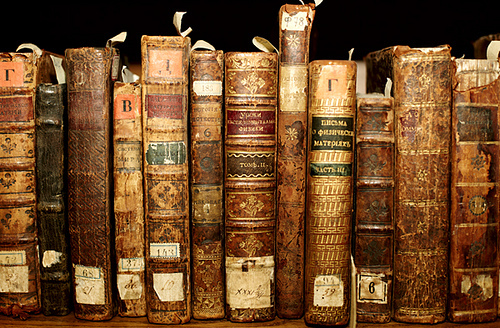 After all, who needs a bookmark when you are reading the latest novel, political kiss-and-tell, or beach lit on a Kindle, Nook, or iPad? 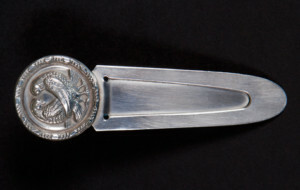 But bookmarks do have an advantage over the objects they’re designed for. 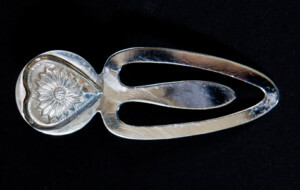 For starters, they’re small, which means that even if you are in the process of deaccessioning your library, you need not let go of your collection of ivory, silver, or silk bookmarks. 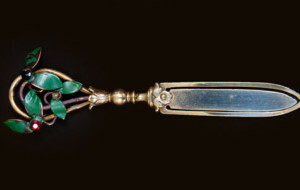 One of the most popular types of bookmarks during the Victorian era were Stevengraphs, which were woven silk bookmarks produced by Thomas Stevens of Coventry, England, beginning in 1862. 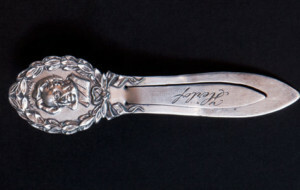 While it was the Jacquard loom that made the Stevengraphs possible, it was Stevens who saw bookmarks as a business opportunity. 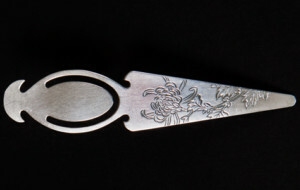 Designs for his bookmarks resembled what we think of as greeting cards today, expressing colorful, if saccharin, wishes for everything from a happy birthday to a merry Christmas. 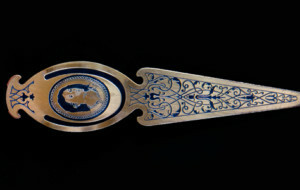 Stevens also produced souvenir bookmarks, such as those made for export in 1876 commemorating the U.S. centennial. 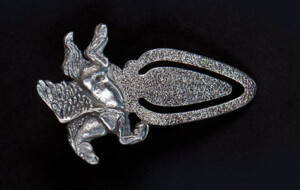 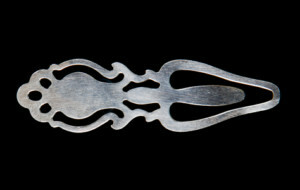 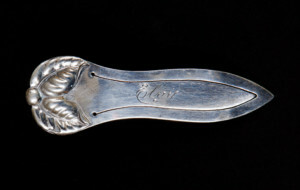 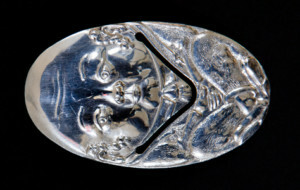 Silver was another widely used material. 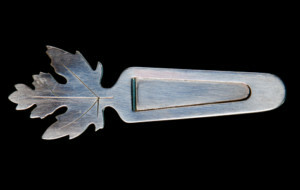 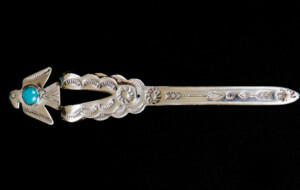 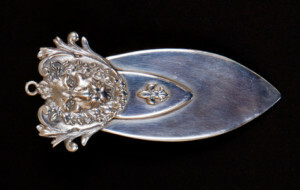 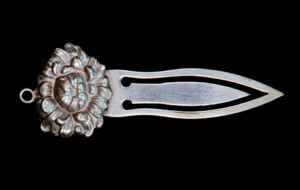 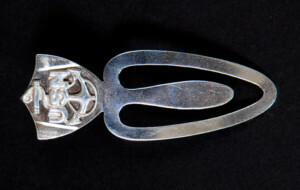 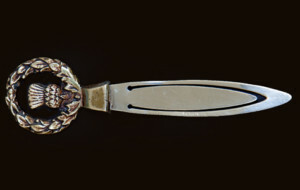 Like silver spoons and flatware, silver bookmarks were hallmarked, bearing icons associated with silver makers such as Tiffany, Gorham, and Towle. 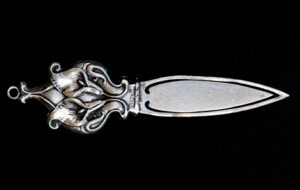 Some silver bookmarks were used to sell ads, in the same way that ads were affixed to everyday objects such as ink blotters and watch fobs. 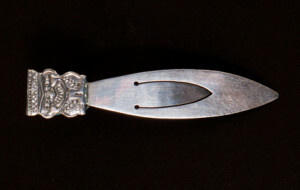 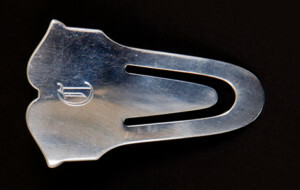 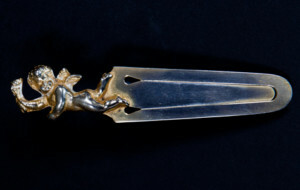 Other featured sharp points and resembled a mason’s trowel, which, according to bookmark collector Howie Schecter, helped readers cut pages that were stuck together due to imprecise binding.